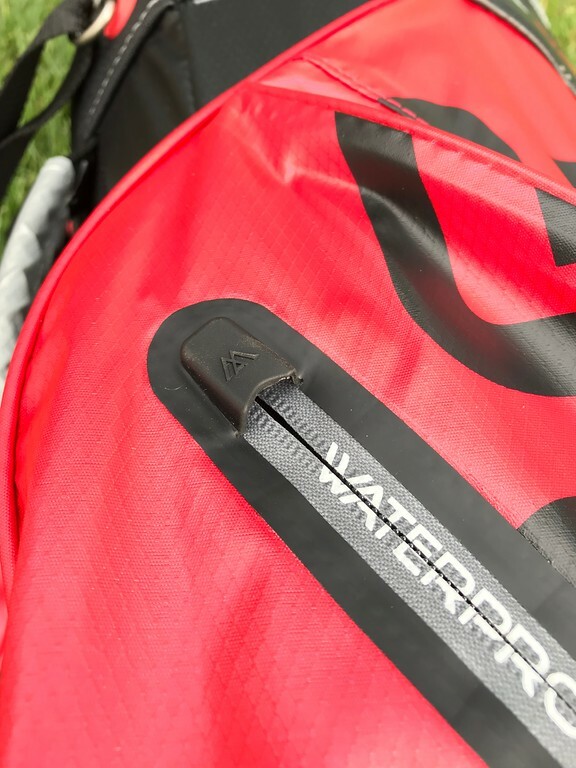 With a name like “Aqua” it comes at little surprise that the Aqua Sport 2 golf bag from Big Max is a combination of unique material and waterproof performance that stands out amongst their bag options for 2018. 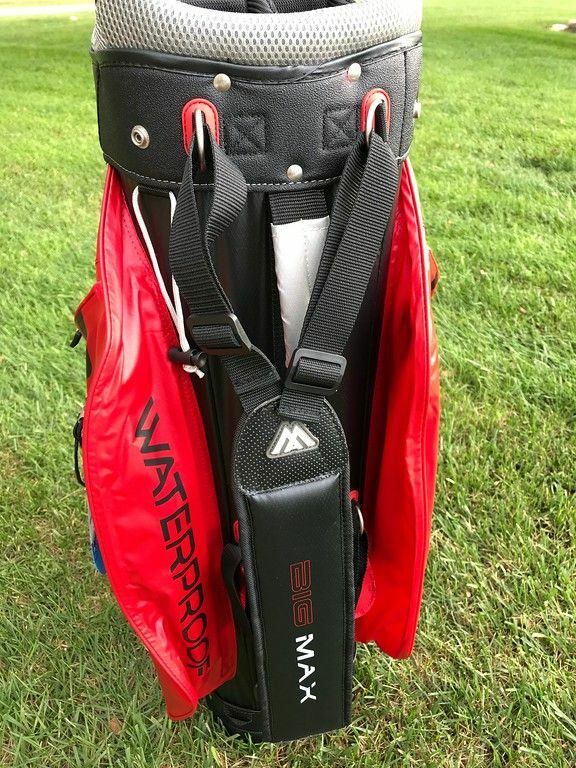 Known for their highly regarded (and impressively compact friendly) push carts, Big Max is showcasing their abilities in creating a quality golf bag ready for all conditions. It comes available in five rather distinct color combinations, ranging for the subtle to sharp visual preferences in overall profile. Out of the box, I was immediately drawn to the unique material that encompasses a majority of the bag exterior. With the waterproof profile, it makes sense that the material feels and looks like something you would find out of a heavy duty umbrella. As the red model was provided, the slightly gloss presentation adds to that consideration, but overall is actually quite appealing to the eye. 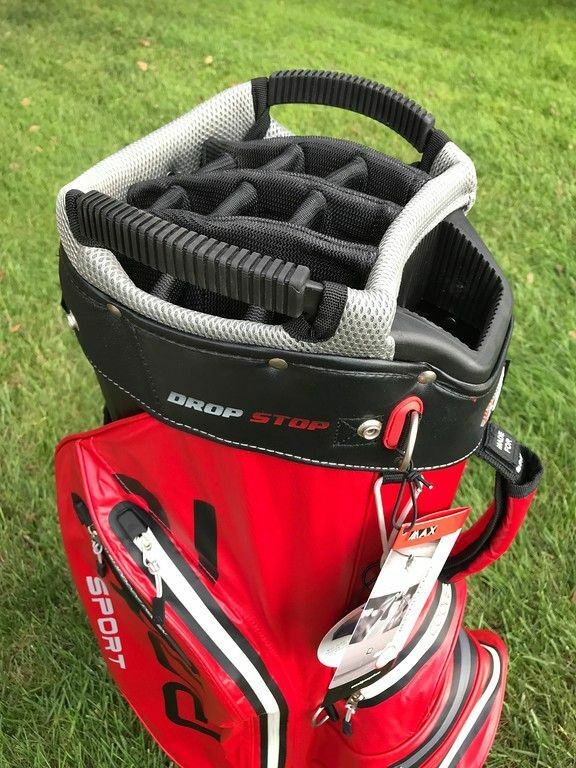 Without a doubt the red is the most boisterous of the colors that are available, leaving it up to the golfer to decide just how lively they want their bag to be on the back of the cart. Being a long time stand bag user, one of the most important things to me was ease of transition, specifically between the car and the clubhouse, as well as the cart and the range. The Big Max Aqua Sport 2 has a comfortable singular strap system tucked away on the back side of the bag that relaxes well on the shoulder. I somewhat expected an uncomfortable experience, but for the limited time the bag was shouldered, it actually wasn’t bad at all. That includes a couple walks that lasted for a good few hundred feet overall. Additionally, loading and unloading the bag can be accomplished easily with both hands, as the top of the Aqua Sport 2 has two handles that serve as great support for the extra hand. Storage wise, the Aqua Sport 2 is loaded with options. Both sides have large pockets that fit any kind of larger item like jackets, gloves, hats, etc. Once again coming from a stand bag background, this feels like a big advantage where I would be more used to one large pocket and a small pocket on the side that rests against the back while carrying. The centralized pocket system includes a ball pocket, tees/accessories pocket, and a much larger cooler pocket that all more or less share the same space. 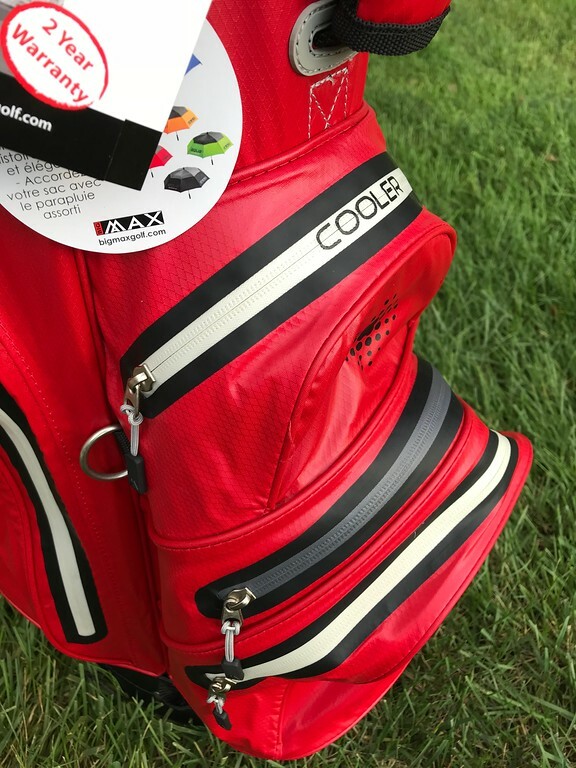 With regards to the cooler pocket, it can fit quite a lot in there, including a water bottle and large energy drink can, however that does reduce the freedom to get hands into the tee pocket. What I really like about the Aqua Sport 2 is the attention to detail on the top of the zipper system in both the larger side pockets, as well as the two valuables pockets. They have a rubberized cap so to speak that goes the extra mile in making sure water does not breach the seam. Speaking of the valuables pockets, they are nice and deep, fitting my full hand inside well into the depths of my wrist. A final mention of pockets on the Aqua Sport 2 is the sneaky bottom back pocket, designed specifically for batteries but suitable for most anything you want to put there. It is very out of the way, and has a chance to eliminate a bit of bulk in one of the other larger pockets instead. Outside of the pocket variety, there are a number of other accessory-esque elements that stand out when visually traveling around the Aqua Sport 2. First, there are multiple glove ‘rests’ around the bag, both facing outward and on the side of the bag. There are also a couple options for towels including the traditional large loop, and oddly enough, two locations for umbrellas to be attached. This seemed to be appropriate if a left handed golfer wanted to shoulder the bag on his left side while still having a locked in location for the umbrella. Big Max was very generous with the sizing of the putter well, giving plenty of room for those with larger grips. I am not traditionally a 14 way divider guy, but in this regard, when the bag is almost always going to be on a cart, I enjoyed the setup immensely. The clubs are separated well, and sit in easy to grab locations both visually and with good spacing. As someone who is pretty persistent about maintaining bag structure at all times, I actually really enjoyed the 14 way profile. It helped that the bag quality made getting the clubs in and out very easy without any grabbing or pinching underneath the surface. The quality is clearly present in the Aqua Sport 2 14 way cart bag from Big Max. Well thought out feature placement, room for plenty of valuables, and enough golf balls to get around the course a few times over, I am confident that this bag will generate interest for anyone getting their hands on one to give it a once over review. It withstood everything I could think of in terms of performance elements, and while I did not get a chance to get rained on, it seems clear to me that the Aqua Sport 2 will be the last of someone’s worries when the rain does arrive. For more information on the Big Max Aqua Sport 2 golf bag, visit www.bigmaxgolf.com. Nice review Dan. The roomy pockets, 14 way divider and multiple spots for towels and gloves plus keeps the rain out has me interested in this one. Solid review Danny, the bags looks like a storage dream. The cooler will or should appeal to a large number of golfers. I’m not a 14 way fan but I know many are. It’s good to see bags like this making a push into the market. Nice review. Favorite color is red and this is nice and loud so I like it. Nice review. I’m so close to getting one of these! !